My new book is called Talk Triggers: The Complete Guide to Creating Customers With Word of Mouth. Written with Daniel Lemin, it gives any and every business a reliable framework they can use to do word of mouth on purpose, not on accident. I hope you buy the book because I know it will help your business grow. Further, the book is 100% no risk. You see, if you don’t like it I’ll buy you ANY OTHER BOOK you choose. Just let me know. To give you a dose of what’s inside Talk Triggers, we whipped up this nifty infographic. The book is available everywhere books can be procured, in all formats. 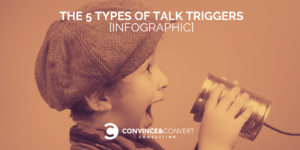 Now go out and create your own Talk Trigger and get your customers telling your story. To subscribe to the video series go to TalkTriggersShow.com or search “Talk Triggers Show” wherever you get your audio to find the podcast. To bring Jay’s customized Talk Triggers program to your next meeting or event, visit JayBaer.com.